Eastern India, Southeast Asia, and northern Australia. The Saltwater Crocodile is usually found in deep, dark murky water. It may inhabit fresh or saltwater but most commonly frequents brackish estuary areas. Adult males can reach up 7 meters in length and weigh 1,000 kilograms. Young Saltwater crocodiles are pale yellow with black stripes and spots found on the body and tail. Adults are darker with light tan to grey areas. Their tails are grey with dark bands. They have up to 68 teeth that replenish constantly and can bite down with more than 2 tonnes of pressure. Saltwater Crocodiles are also known as ‘Estuarine Crocodile’, ‘Indo-Pacific Crocodile’ and ‘Salties’. Their scientific name ‘Crocodylus porosus’ means pored crocodile. The Saltwater Crocodile is the world’s largest reptile. Crocodiles can smell food or water from hundred of meters away. The name ‘Saltwater Crocodile’ is very misleading as they can live happily in freshwater river, swamps and billabongs hundreds of kilometers inland. 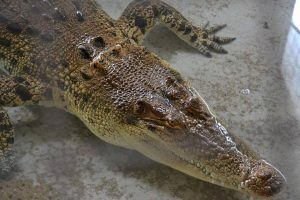 Salties are considered the most dangerous crocodilian to humans as they are responsible for numerous attacks. Diet: Juveniles are restricted to smaller prey such as insects, amphibians, crustaceans, small reptiles and fish whilst the larger “Saltie” can prey on anything they can get their jaws on, including water buffalo, monkeys, wild boar, and even sharks. Salties spring on their prey without warning, they explode from the water with a thrash of their powerful tails, grasp their victim, and drag it back in, holding it under until the animal drowns. Large male crocodiles will patrol their stretches of water protecting their territory from intruding males. Reproduction: When courting Salties will rub their heads and bodies together. Mating takes place in the water. 4-6 weeks after mating, the female will lay 40-60 eggs in her nest. The nest may be up to 80cm high and is made of vegetation broken off by the female’s teeth and scraped together with her hind legs. A large adult crocodile can stay submerged for over 2 hours.